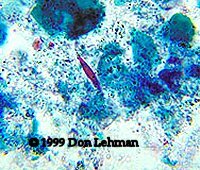 Charcot-Leyden crystals are formed from the breakdown of eosinophils and may be seen in the stool or sputum of patients with parasitic diseases. The crystals are slender and pointed and stain purplish-red in the trichrome stain, as shown in this image. These crystals can appear in a variety of sizes and only indicate an immune response, but the cause may or may not be a parasitic infection.